It is not solely because the intellect is less cultivated, manners in high life less refined, conversational powers of a much lower order in China than in the New or Western world, that juggling and legerdemain prevail so generally; these amusements have predominated throughout Asia for thousands of years, and are protected permanently by prejudice. Our ignorance of early Chinese history, and our want of confidence in native authorities, deprive us of the knowledge of many facts, both interesting and important: no doubt, however, remains as to the very early existence of the art of conjuring amongst Orientalists generally. In Farther Asia, the aborigines have always been represented as possessing great pliancy of limbs, as well practised in the arts of balancing, vaulting, tumbling, and in moving the body with rapidity and regularity. Fanatical penances, and religious orgies, during which the most unnatural contortions were exhibited, either from deception or actual pain, appear to have been the foundation of those juggling or gymnastic tricks which now excite so much astonishment in Europe, so much admiration in Asia. The wretched victims of a barbarous creed, that are crushed beneath the wheels of the car of Juggernaut, illustrate, by their self-immolation, the impious origin to which Oriental juggling may be traced. With more truth and certainty, however, may the sports and antics of the luxurious Romans be described. Games in which balls of various bright colours were thrown round the body without interruption-exercises in equilibrium, wherein the least false movement was instant death-were exhibited not only in imperial Rome, but in all the great provincial towns. In the baths of Agrippa, of Titus, and of Trajan, at Rome, a bear was exhibited, dressed in a long toga, who played all those curious tricks with the coloured balls, that have so much surprised Europeans, since the commencement of the present century, when performed by Hindoo jugglers. 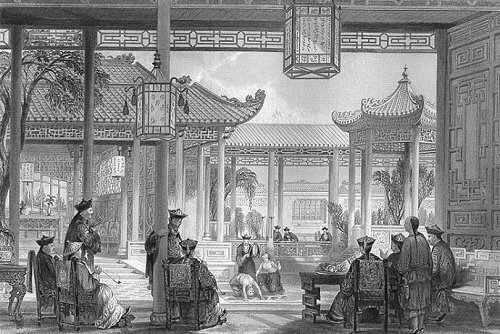 When the banquet is finally ended in a great man's palace, the guests are conducted to an open court, surrounded by pavilions, and decorated with china vases, aromatic plants, and gorgeous lanterns. Here a company of fortune-tellers, with their sticks of fate-conjurors with cards and dice, and well skilled in sleight-of-hand-tumblers, capable of performing evolutions, displaying agility, muscular strength, and suppleness, not equaled beyond the limits of the olden world, is assembled. The display of keeping four, and even five balls, cups, or knives, in constant gyration, has been made by Chinese and Hindoos in England; but not the performance of the same feat with two balls and three knives together. This difficult exploit was very popular in ancient Rome, where the knife-catchers were called ventilatores, and the ball-throwers, piluru. The Chinese, however, perform a greater number and much more artful tricks than the Hindoos. It is not uncommon to see a performer balance on his forehead a little building, consisting of a number of pieces of wood, which would all fall apart, if the balance were not the most exact; and, during this feat, the actor keeps a number of rings in motion with his toes, in a manner that seems to require the greatest attention. Stringing pearls with the tongue-swallowing a sword-blade-carrying about the person, and producing them unexpectedly, large china bowls, full of water to the brim, and flower-pots with plants of two feet in height standing in them-changing the colour of powders, almost under the watchful gaze of the spectator-drawing many different kinds of wine from the same column in the dining-parlour, by piercing it with a gimlet-swallowing and disgorging miles' length of paper shreds, and tossing a brass ring, which the company are at liberty to examine minutely, into the air, where it separates into two, then four, then six rings, of equal size with the original, and, as they fall into the hand, forming them into various mathematical combinations, are amongst the variety of illusions practised by by Chinese conjurors. The infancy of China has been longer than that of any other country hitherto known upon earth: her religion is childish, her literature childish; the amusements of her people cannot, therefore, be expected to assume a character more rational or refined, until true national worth and wisdom shall have a secure foundation sunk for them. Wright's arrogance here, particularly in the final paragraph of this commentary, makes me wish I could reach back a couple hundred years and box his ears. As the poets Ersites and Venis no doubt would have said, "What a pathetic moron."